Many Drouot regulars still remember the silhouette and benevolent smile of Guy Portier (1919 - 2005). He set up his consultancy firm at 52 Rue Taitbout in Paris, where he would welcome collectors or simple art lovers, specialists and researchers alike with the same courtesy and desire to share. His love and knowledge of the arts of Japan was in his blood. His family "turned up" in Asia in 1875, when Henri Portier specialised in importing silk from China and Japan and at the same time became an avid collector of far Eastern objects, with a penchant for Japanese prints. In a few years, he assembled an impressive collection of not only prints but also tsuba, bronze, jade, ivory, lacquer, sculpture and porcelain from China. When his American subsidiary went west in 1902 and he was forced to sell a large part of his collection – 499 lots were auctioned at Drouot. The Portiers’ passion for prints started with Henri, founder of the dynasty, then continued with Guy – Thierry meanwhile preferring the subtle tones of stoneware to the finesse of paper. The works up for sale mainly come from the original collection built up by the elder Henri at the end of the 19th century, a period when all the principal Asian art collections were formed. 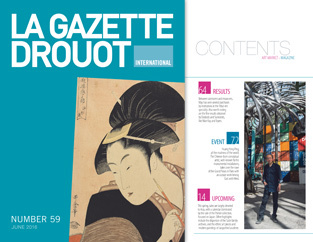 At that time, the history of the Japanese print was developing alongside that of France, its artists, writers, historians and dealers, including Monet, Degas, the Goncourt brothers, Guimet, Burty, Gonse and Sichel. These were the people who made Paris the capital of Japonism, and raised this art of the multiple to the rank of art work. 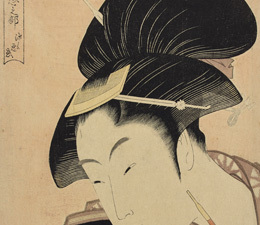 Here Hokusai was celebrated on an equal footing with Poussin, as were Utamaro and Sharaku, masters of ukiyo-e, to which the Portier collection pays tribute. "These prints were not included in the famous sale of 1902," says expert Alice Jossaume, who considers that "here, quality takes precedence over quantity." The group contains only ten or so prints – but such prints! This spring, several events are celebrating Asian art in the saleroom. The highlights include the sale of the Portier collection devoted to Japan on 21 June and a group of Sino-Tibetan gilt bronzes from a Parisian art lover's collection. As often with these Asian seasons, eclecticism is the order of the day, with works by Chu Teh-Chun, Lin Fengmian and Sanyu rubbing shoulders with Wanli period porcelains, rhinoceros horn drinking cups and objects from Korea…. So, let's go! Yan Pei-Ming has returned to Rome. Twenty years after his stay at the Villa Medici as a resident student, the artist has come back in his own right. Meanwhile, he has matured. He has perfected a powerful, magisterial, personal style with universal appeal (even more so after his participation in the 2003 Venice Biennial), forging far ahead of many more demonstrative Chinese artists whose work has not stayed the course. Because Yan Pei-Ming, who was born in Shanghai in 1960 and has lived in France since 1980, set himself a goal and stuck to it. Jean-François Milou receives us in his Paris studio in the Marais district. The man is tall – very tall. Asia? He knows it well. With expertise assignments for UNESCO in Nepal and India and various projects carried out in Vietnam and Georgia (the Caucasus), the French architect has spent a considerable time exploring the continent and its architectural treasures, including Bagan (Myanmar) and Angkor (Cambodia). A family characteristic he undoubtedly inherited from his father, a philosophy lecturer at the University of Nanterre, and a great specialist in Eastern thought systems. One day in 1967, Park Seo-Bo came upon his son trying to copy his older brother's writing. His attempts were a failure, and the characters invariably spilled over the squares supposed to contain them. Miserable and furious, he scrubbed out the signs. Eureka! "That was resignation!" wrote the painter, who in the midst of a profound spiritual crisis, sought how to express the awakening to resignation and relinquishment of all desire. "That was the moment when I found the way to express this abandonment of desire."